Weinberg sophomore Archit Baskaran, a candidate for executive vice president, answers a question during Tuesday’s debate. Baskaran is running with Weinberg junior Joji Syed (left). SESP junior Christina Cilento is running for ASG president with McCormick junior Macs Vinson. The candidates for Associated Student Government president and executive vice president discussed their past roles in advocacy and student group outreach Tuesday night at the Coalition of Colors-moderated debate. 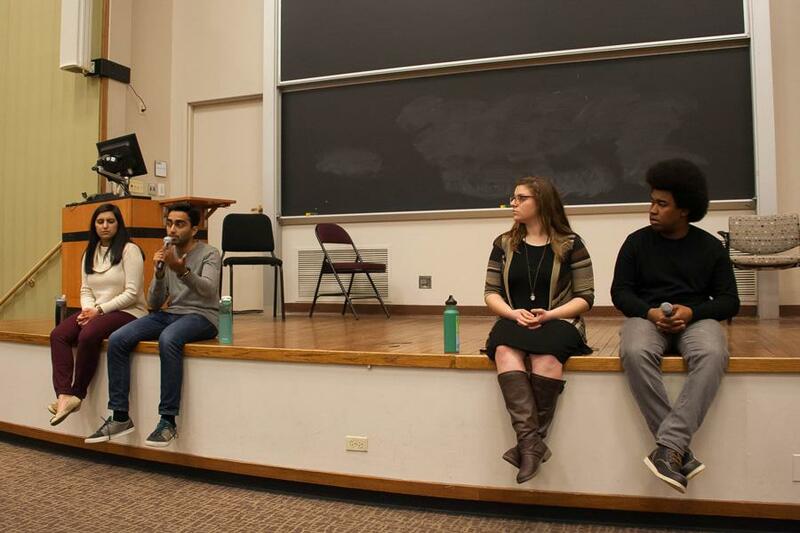 Joji Syed, a Weinberg junior, and her running mate Archit Baskaran, a Weinberg sophomore, pointed to their involvement in the multicultural community as personal experience working with marginalized students. Christina Cilento, a SESP junior, and her running mate Macs Vinson, a McCormick junior, pointed to their solidarity with three divestment campaigns as evidence of their activist backgrounds. Cilento said her views supporting divestment are important to publicize since the campaigns have been a large part of her experience at Northwestern. The three divestment campaigns – Fossil Free Northwestern, NUDivest and Unshackle NU – have all endorsed Cilento and Vinson. Cilento and Vinson also mentioned that before the debate, they attended a dinner with University President Morton Schapiro but walked out since they said he was not paying enough attention to divestment campaigns. On the other side, Syed chose not to publicly express her opinion on divestment campaigns because she said offering any opinion would make some students feel left out and she wouldn’t be as approachable as a student government president. Syed and Baskaran said they met with individuals involved with Unshackle NU, NUDivest and Fossil Free NU, but did not sit down with the groups as a whole. There was “no intention of exclusivity” in not meeting with the groups, Baskaran told The Daily. The two tickets also discussed their focuses on improving mental health resources on campus and how issues with Counseling and Psychological Services disproportionately affect marginalized students on campus. Cilento and Vinson have stressed eliminating the 12-session CAPS limit, and Syed and Baskaran have stressed the creation of “wellness chairs” in student groups, which was just approved by CAPS. Weinberg junior Jackson Walker, who attended the debate, said he’s undecided and wanted to learn more about the candidates’ platforms. Although he agreed both campaigns care about marginalized students, he said Syed and Baskaran were not as strong in their rhetoric. Walker added that this year was the first year he took an interest in the ASG election. The Daily will moderate the final debate Wednesday at 8:30 p.m. at McCormick Auditorium in Norris University Center. Voting will start Thursday at 5 p.m.